WaterField Designs is one of the first computer luggage vendors getting cases for the new 17" Unibody MacBook Pro out the door with its custom-fitted, protective SleeveCase. The company says that having its manufacturing operation in San Francisco enables it to design and ship custom cases for new electronic devices lightning fast. 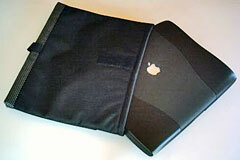 The new size 17-3 SleeveCase is available for pre-order from sfbags.com now and will ship January 16, 2009. WaterField also offers a 17" MacBook Pro compatible version of its Racer-X case, an example of which I've been using to pack my 17" PowerBook G4 around with for the past three years. 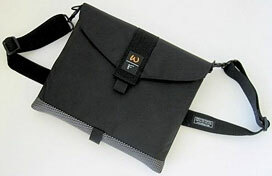 Waterfield computer bags are high-end products, with first class design, workmanship, and materials. They are made, as the company proudly affirms, in San Francisco, where rents are high, labor expensive, and the competition fierce. Consequently, they are a bit pricey, but the discerning customer will perceive value for money spent. The Waterfield look is distinctive and understatedly tasteful, striking a sweet spot between being jaunty and buttoned-down. Carrying one won't make you look like you're just coming from a board meeting, but it would have fit in perfectly well if you actually were at one. 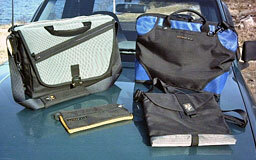 The Waterfield SleeveCase, like other Waterfield computer bags, can be ordered in a wide range of configurations, sizes, and the accessorization. Some 30 different size options are available, including ones to fit every Mac notebook model. The SleeveCases are designed both as a standalone product and to serve as an inner protective module for Waterfield's larger computer bags like the VertiGo, Cargo, and Cozmo models, with which it can be purchased in ensemble bundles called "Mambo Combos". "To protect your investment, it is important to cushion your 17" MacBook Pro while in transit," explains company owner, Gary Waterfield. "You'll want your case to fit snugly for optimal protection. The WaterField Designs case is an exact fit for the new 17" MBP dimensions and it's very protective. For scratch protection, our Suede Jacket Sleeve is a great option; it doubles as a screen-cleaner too"
SleeveCases secure and protect your 'Book, whatever size, without zippers, allowing quick access to the laptop. 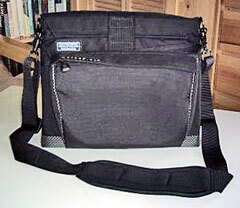 They combine a rugged ballistic nylon outer shell with a high-grade, 6mm neoprene interior that absorbs shock as it cradles the computer. A handy loop at one end lets users hold the SleeveCase while easily removing the notebook. Travelers passing through airport security can leave the laptop protected in the TSA-friendly sleeve while it makes its way through the x-ray apparatus, thereby minimizing loss or damage at security checkpoints. 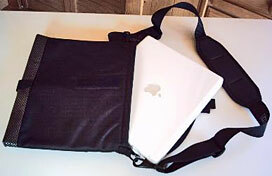 SleeveCases are available in horizontal or vertical orientation (people who carry the SleeveCase inside a typical backpack will prefer a vertical SleeveCase, while if the SleeveCase is to be used in a horizontal case like the Waterfield Cargo, then you will probably prefer a horizontal SleeveCase), with or without the closure flap, and with two shoulder-strap options. I've used two SleeveCases; a basic flapless, strapless model in Size 14 that fits my Pismo PowerBook (above), and a fully tricked-out Size 8 unit that snugly embraces my 12-inch iBook (below), complete with optional flap ($15) and suspension strap of 1-1/2" nylon webbing with a fixed shoulder pad (complete with "traction" panel) and very high quality quick-release carabiner hooks on stout swivels that snap onto beefy metal D-rings fastened to the Sleeve Case with stitched web loops ($18). A regular strap is $12. As a nice service to its customers, San Francisco Designs will retrofit SleeveCases returned for upgrading with the shoulder strap options for the standard option price. Both SleeveCases feature Waterfield's tasteful, understated styling in black ballistic nylon with textured Indium accent across the bottom. The basic SleeveCase has a robust closure strap of 2" nylon webbing that fastens with a generous Velcro™ panel, while the flap on the other case also is secured with Velcro, in both instances making for security with quick access. Both cases have a full-width pocket on their external back panels, which oddly (I thought) has no Velcro or zipper to retain items deposited therein. 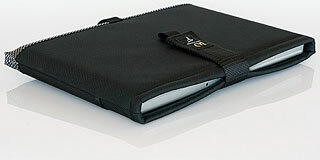 Moving inside, the SleeveCase is lined and padded with 1/4" or 3/16" Neoprene "wetsuit" type material, which serves the dual purpose of protecting the computer against bumps and bangs, and the finish from scratches. Actually, I'm guessing that it actually is wetsuit material, which seems appropriate to the SleeveCase's California origins. Everything is beautifully stitched, and the materials have a rich, luxury feel. Perhaps some readers are saying to themselves something like: "SleeveCases sound convenient and nice to carry, but what about peripherals like the computer's AC power adapter and perhaps a mouse and some cables?" 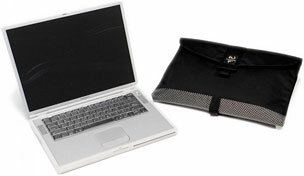 Not to worry - while the computer entirely fills the SleeveCase's internal compartment, and the external pocket can only accommodate very thin items like papers or a magazine, Waterfield offers a solution to peripherals carriage in the form of a small, clip-on auxiliary case it calls a "Piggyback", which describes its function like handily. To use the Piggyback, it is necessary to also order the shoulder strap option, since the smaller bag clips onto the same D-rings used to attached the strap via quick-release snap hooks. Made from the same ballistic nylon as the SleeveCase outer shell and with reinforced zippers, the Piggyback has soft divider pockets inside to protect your power adapter, even a small external drive or other bits and incidentals. The internal pockets aren't quite large enough to accommodate my Pismo's "flying saucer" power adapter, but the 45 watt adapter of my iBook fit neatly, and there's plenty of room in the main body of the bag for that awkward saucer (not one of Apple's better ideas). The Piggyback is a $22 option. 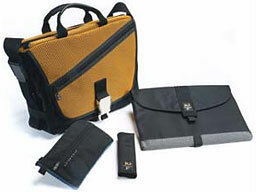 In summary, if you need a laptop bag that won't look out of place in any setting, no matter how upscale, or just appreciate top-drawer quality, you owe it to yourself to pay a visit to Waterfield's website, where you can choose, customize, and accessorize a case to fit your machine, your lightweight laptop carriage needs, and your tastes to a "T". The 17-3 SleeveCase is compatible with the Large Cargo ($219-$269) Large Cozmo ($189-$219), and X-Large VertiGo ($89). To protect accessories see the Gear Pouch ($19-$25), CableGuy ($19-$25), and Keyboard Cases ($29-$49). All products available exclusively from WaterField Designs.